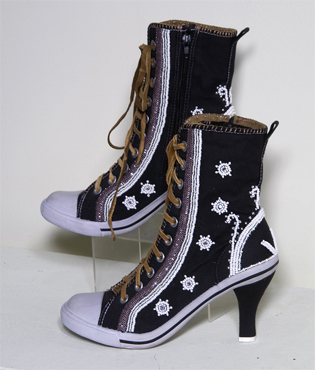 Elizabeth Doxtater, Mohawk, These Boots Are Made for Falling: Tribute to Iotsitsisen, mixed media, beadwork, 2014. In 2015, the Coby Foundation awarded $475,000 in grants, more than it has distributed since 2007. Eighteen organizations received funding for fashion and textile projects from the foundation, the only one of its kind in the United States. Fashion–related exhibitions dominated, ranging from Fairy Tale Fashion at the Museum at FIT to #techstyle at the Museum of Fine Arts, Boston. Fairy Tale Fashion at the New York’s Fashion Institute of Technology uses fashion to illustrate more than twelve fairy tales, including Cinderella, Sleeping Beauty, and Little Red Riding Hood ($25,000). The #techstyle exhibition at the Museum of Fine Arts explores how the synergy between fashion and technology is changing the way designers design and the way people interact with their clothing ($20,000). Two other fashion exhibitions received substantial funding. Mod New York: Fashion Takes a Trip, scheduled for winter 2017 at the Museum of the City of New York, traces the stylistic progression of 1960s fashion ($40,000). Isaac Mizrahi: An Unruly History, at New York’s Jewish Museum, explores Mizrahi’s position at the intersection of high style and popular culture ($50,000). The Foundation also provided support to three exhibitions that have already closed: the American Folk Art Museum’s When the Curtain Never Comes Down, which the New York Times called “fresh, innovative and view-altering” ($15,000); the Bard Graduate Center Gallery’s Fashioning the Body: An Intimate History of the Silhouette, which focused on structured garments, especially undergarments, from the early 1600s to the present day ($30,000); and Buckskin to Bikinis : Haudenosaunee Wearable Art, a survey of contemporary Iroquois fashion at the Iroquois Indian Museum at Howe’s Cave, NY ($15,000). A commitment to textile traditions from around the world was again demonstrated in 2015 grants to the Textile Museum, Washington, for China: Through the Lens of John Thomson, which featured pieces from the Museum’s collection of Qing Dynasty textiles and accessories alongside Thomson’s powerful black-and-white images ($20,000); Art of the Zo: Textiles from Myanmar, India, and Bangladesh at the Philadelphia Museum of Art ($20,000); and Wondrous Worlds: Art & Islam Through Time & Place at the Newark Museum, which features works from the Museum’s collections ($50,000). Coby funds were granted to an exhibition of ancient art, Designing Identity: The Power of Textiles in Late Antiquity at NYU’s Institute for the Study of the Ancient World ($25,000); an examination of modernism—Pathmakers: Women in Art, Craft and Design, Midcentury and Today at the Museum of Arts and Design, NYC ($10,000); and one-woman exhibitions of recent work by Nancy Shaver and Ruth Root at the Aldrich Contemporary Art Museum in Ridgefield, CT ($15,000). Two major tapestry projects received Coby support. One is an exhibition at the Worcester Art Museum of The Last Judgment, a 26-feet-wide Flemish work from around 1500 ($50,000). The other is at The Breakers in Newport, which received $15,000 for the conservation and exhibition of The Family of King Darius of Persia Paying Homage to Alexander the Great, an early 17th-century Dutch tapestry. Finally, the Museums of Old York (ME) was awarded $35,000 for the conservation and exhibition of the Bulman Bed Hangings, believed to be the most complete surviving set of American embroidered bed hangings from the 18th century. The James Michener Art Museum (PA) received support for an exhibition of quilts that combined 19th-century British examples with recent work by designer Kaffe Fassett ($15,000).